This is an account of the Nordic mission. God is the One and only who leads us in the race we have started, and it is indeed a training to be going on a mission. It is noticeable that God always provides His instrument enough strength to proclaim a resurrected Christ and to glorify Him. His Voice, as it is heard through His messages, puts blazing fires in each heart without exception, leading His people with grace in their faith, so as to bring it to perfection. Vassula and I left Athens for Copenhagen on Thursday, since the program was scheduled for the following day. We did not encounter any disturbances while travelling to the destinations for this mission; instead we felt the Holy Spirit’s presence providing us with open-hearted people. 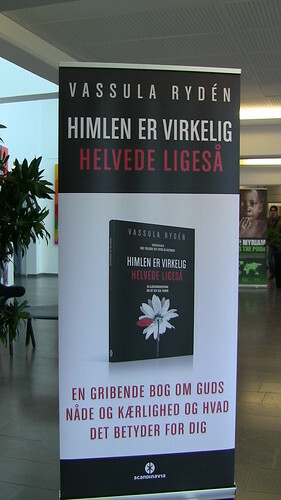 The following morning, a meeting was arranged with the publishers, Scandinavia, who published Vassula's book, Heaven is Real But so is Hell, in Danish. We arrived at the publisher's office and were cordially greeted. They had even prepared a morning breakfast. Since this was their first time meeting Vassula, they wanted her to feel very welcomed. Asked to lead them in prayer, Vassula opened our little prayer book and read the prayer that Jesus gave her on July 18, 1990. She asked everybody to stand while she prayed. 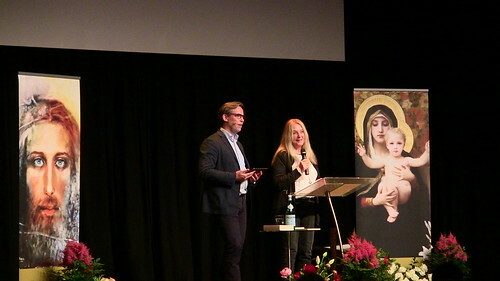 Then he and his son, Jacob Vium Olesen, along with their employees asked Vassula a series of personal questions as well as questions pertaining to her spiritual mission, as they listened to her story and how her experiences began. 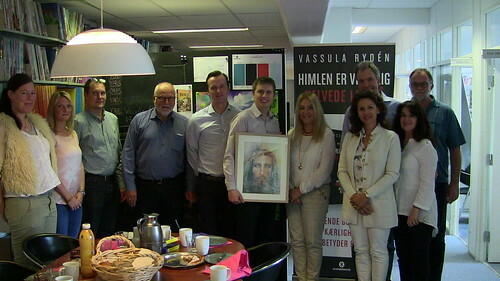 Jacob ended the meeting with a prayer, and our TLIG friend, Frank, offered them a copy of a painting done by Vassula of Jesus’ Shroud. They were very touched and happy to hear that she had painted it. 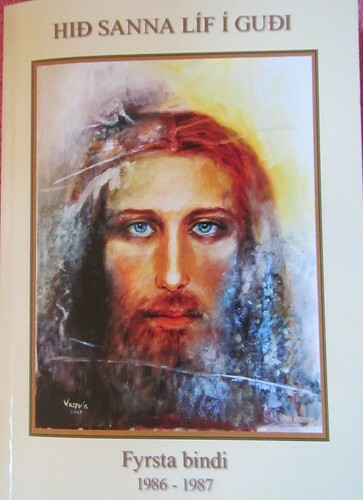 Frank explained that Vassula sees Jesus in the manner He is depicted in the painting--with blue eyes. We then departed for the church where Fr. Lars Messerschmidt, a longtime supporter and believer of the Messages is stationed. 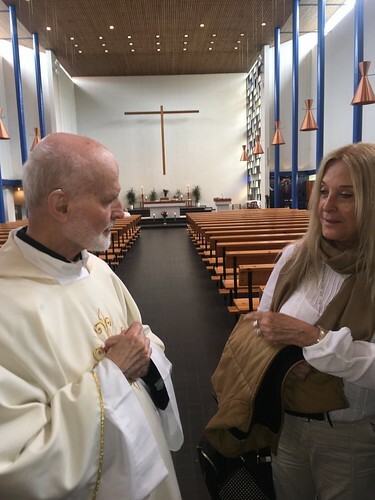 He is also the only exorcist priest in Denmark. You can read this interesting interview on him. Fr. 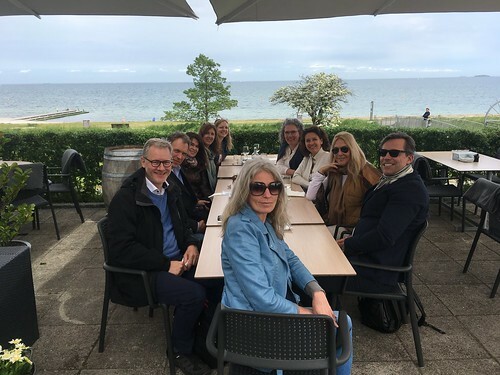 Lars celebrated a special Mass for us and thanked Vassula for coming to Denmark. He asked the congregation for special intentions directed towards the fruitfulness of her witness meeting. Moreover, he prayed for the organizers, asking our Lord to enflame his people to preach about Christ. 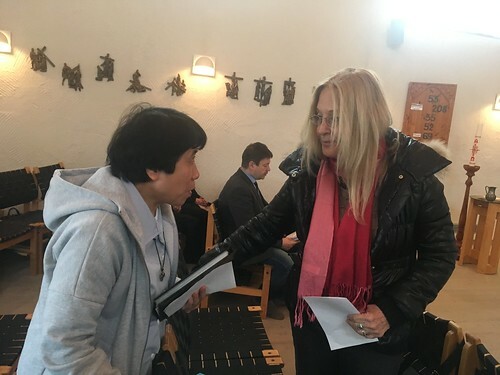 After Mass, Elisabeth Astrup from the Danish newspaper Politiken came to interview Vassula at the church. The interview was published on June 11. Here is the interview in Danish. "On Friday the second of June this year, she stands in the spotlight on a stage adorned with flowers in outer Nørrebro. 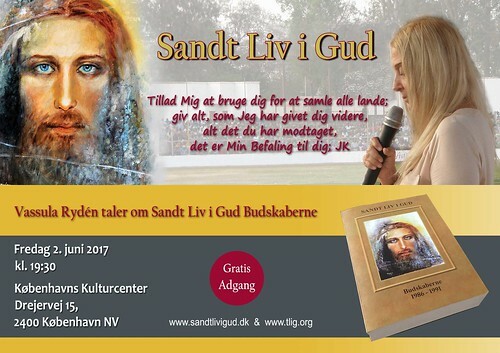 Several church communities in the Nordic Countries have invited her to give talks about her conversations with God throughout three decades. 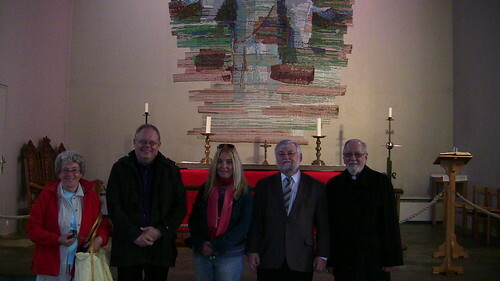 Earlier this day Politiken meets with her in the Catholic Knud Lavard in Lyngby. It is Friday evening in outer Nørrebro. The doors are open to Københavns Kulturcenter on Drejervej. Music of praise sounds from inside: old revival hits from the seventies. About 300 people have found their way inside. Most of them from the generation with reading glasses, but also many young people with sunglasses in the hair, Catholic priests and German speaking people. 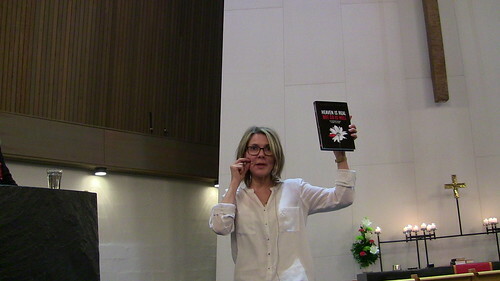 Most of the evening’s program is simple: Vassula Rydén reads from her conversations with God and places the conversations in a context--a kind of sermon. Vassula Rydén’s talk lasts one and a half hours. The hall is dim apart from the spotlight on the stage. Nobody whispers or fools around. Some listen with their eyes closed. Others have their eyes fixed on the stage. 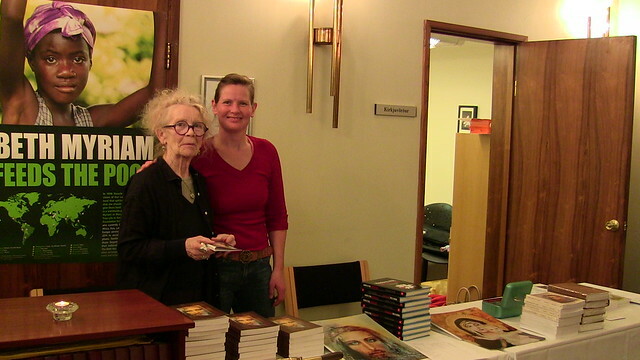 Fifty-year old Lene Gosvig and 31 year-old Karen Reiter are among the listeners. They both have associations with the Church, and their everyday jobs are as a psychiatrist and a nurse. ‘I was a little in doubt and skeptical when I arrived. However, I am pleasantly surprised. 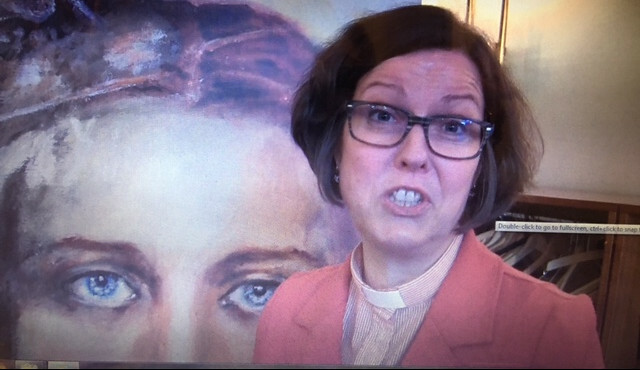 It is very much about having focus on the grace,' says Lene Gosvig. Karen Reiter sees the messages as ‘very insisting,’ probably because she has experienced all of it herself. 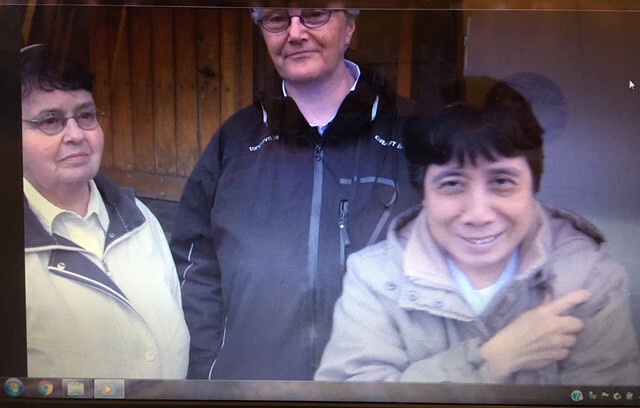 'They were delivered with a high degree of presence and are actually very simple--they return constantly to the love of God,' says Karen Reiter. 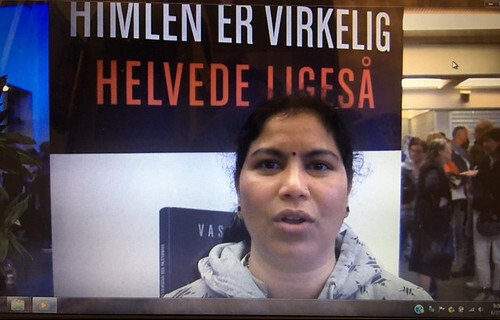 One can find many interviews with Vassula Rydén on YouTube. Here she speaks prophetically. She is more cautious this Friday, as though wanting to disclaim that name that people usually attribute to her. The average Dane will consider your words as far out. They live as you once lived. What will you say to them? How can ordinary people make contact to God? Gethsemane, one of the TLIG volunteers, mentioned to me that she heard the newspaper’s web designer who was present say she had never before heard anyone speak like this. The newspaper’s photographer, Finn Frandsen, said he had never before heard of anyone having had an experience like Vassula's. This shows how attentive they were to the nearly one-hour interview. 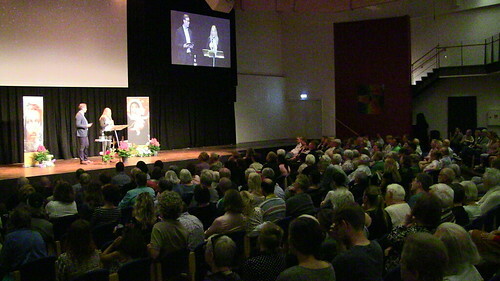 At 6:30 p.m., people began arriving at the Copenhagen‘s Cultural Center,, Københavns Kulturcente to hear Vassula’s talk. I was able to get a few testimonies from the people about how the talk had touched them. On Saturday, we were on our way to the Faroe Islands. This is Vassula’s third visit, as she was there in 2004 and in 2011. 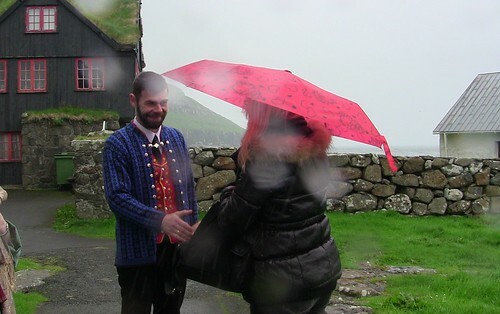 The Church of the Faroe Islands is one of the smallest of the world's State Churches. 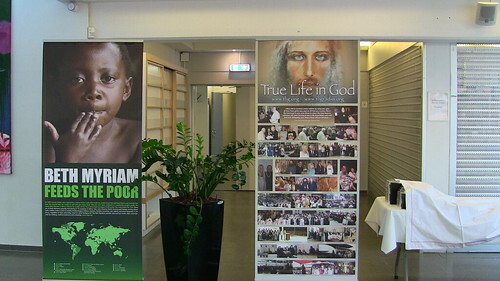 Prior to becoming independent on July 29, 2007, it had been a diocese of the Church of Denmark--a Lutheran church. 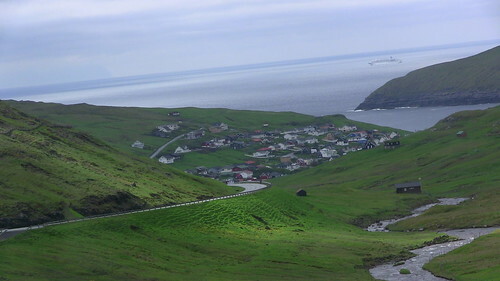 About 81.6% of the Faroe Islanders belong to the State Church. 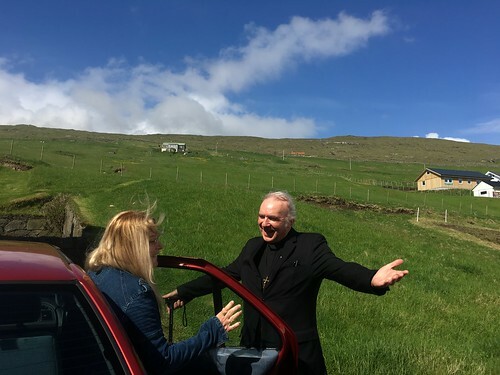 Once we arrived at Vagar airport, we were greeted by Fr. Paul Marx and Erla Simonsen. Fr. 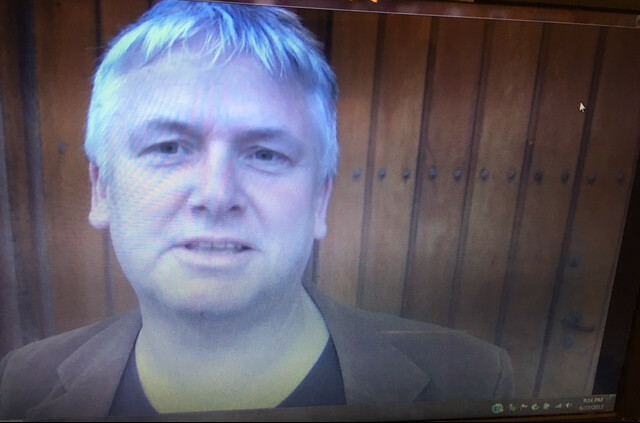 Paul, who had invited Vassula to give a talk in his church in Copenhagen over 20 years ago, told her that when he first heard her talk, he loved her simplicity of speech. We drove to the village of Midvagur and arrived at the home of Bjarni and Gurl Joensen, who offered us a warm meal. Jacob and his wife were also there. Their father, Bjarni, had attended Vassula’s meeting when she was in the Faroe Islands years ago. He had the TLIG One Book in English that he was presently reading. 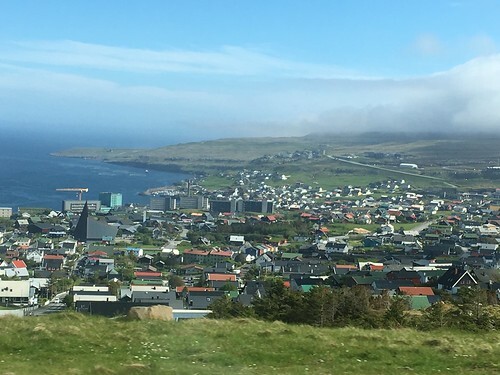 Torshavn, where we would be staying and where Vassula was scheduled to speak, is the Faroese capital and the largest city in all the Faroe Islands. It is one of the world’s smallest capitals, with a population of 18,300. On the day of Pentecost, we were invited by Fr. Paul, to attend Mass at the Catholic Church in which he serves, called Mariukirkjan. One of the Filipino Dominican nuns, Sister Yolanda Aurora, approached us as soon as we entered the church and told us that she read the TLIG Messages. 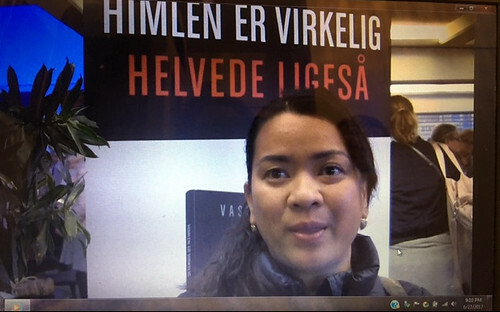 She relocated from Russia to the Faroe Islands because there is a growing Filipino community in the Faroe Islands. In general, there is a shortage of women on this island, and the men, through a special Internet site where people search for husbands or wives, realized that many Filipino women are searching to get married. The men help them come to the islands and then marry them. Consequently, the women generally bring their relatives into the country. 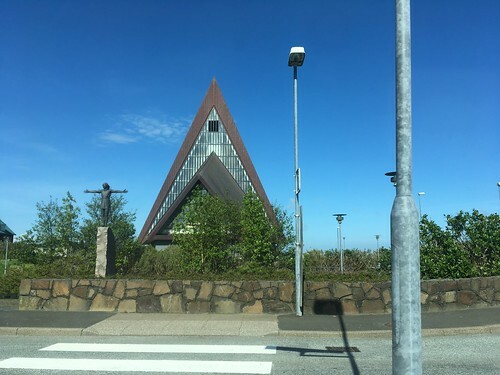 Vassula’s wild guess is that this movement is willed by God so that Filipinos who are devout Christians may start evangelizing and reviving the Christian faith in the Faroe Islands. 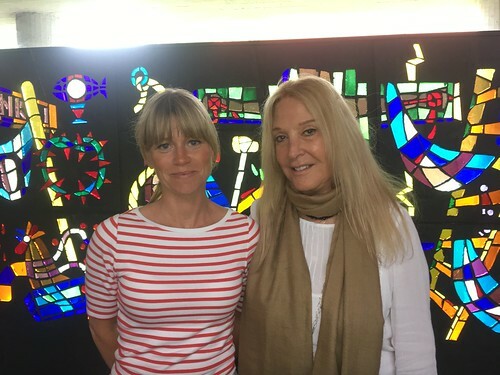 This shortage of women is due to the fact that when the local women enter Denmark’s university system, they find a job in Denmark after graduating and remain there. After Mass we were driven to Kirkjubøargarður, a village that was historically important in the Middle Ages. The old Kirkjubour farmhouse, the oldest inhabited wooden house in the world, is found in Kirkjubøargarður. It was built in the eleventh century. 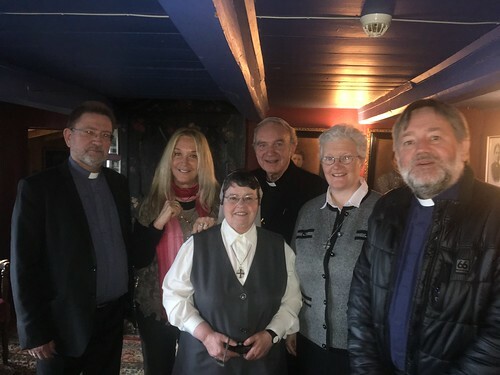 Four clergy members who were present were invited to have lunch with us: Pastor Heri Joensen--the Dean of the Lutheran Cathedral Church named Domakirkjan, the Very Reverend Uni Næs, and two nuns. 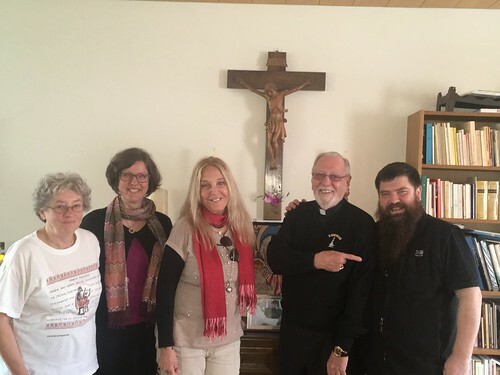 Sister Marisa Spiteri--a Franciscan originally from Malta and Sister Maria Forrestal, also a Franciscan, originally from Ireland, joined us along with the family that has owned the home for seventeen generations, the Joannes Patursson family. 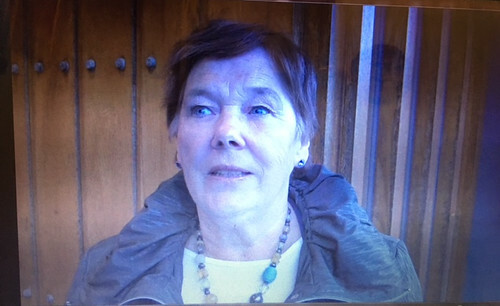 Sister Mary Forrestal, a Franciscan Missionary of Mary, said she wasn't interested in the Messages years ago when she first heard about them. She explained that when she heard Fr. 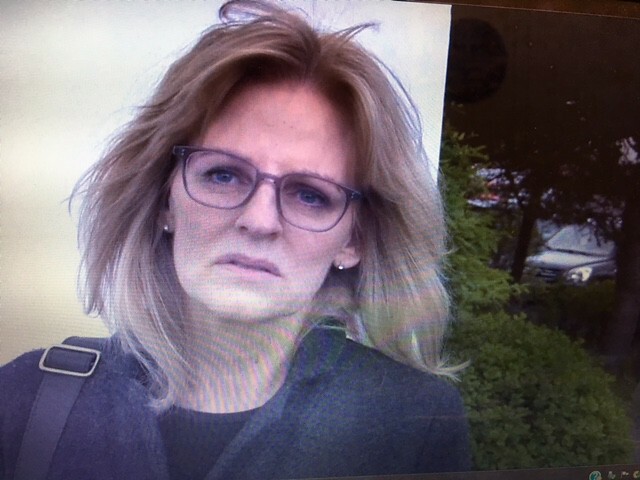 Lars say he had read the Messages and that he believed they were authentic, (he admitted that the first time he met Vassula he saw Christ appear on her face) she told herself she should be open to reading them. She continued by saying how much she loves reading them, as they are hope for our times. Before we departed, I gave the family owner of the house a recently published TLIG newsletter. 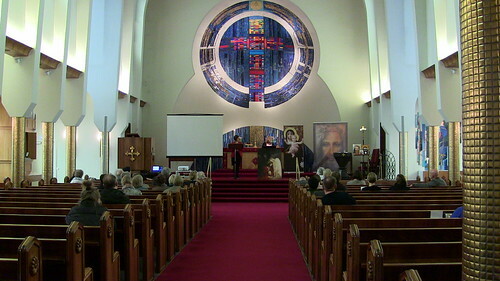 In the evening we went to Vesturkirkjan, the cathedral where Vassula's talk would begin at 7:00 p.m. There were approximately 150 people in attendance. Most of them were new and young as well. Jon Sigurd Hansen introduced Vassula. 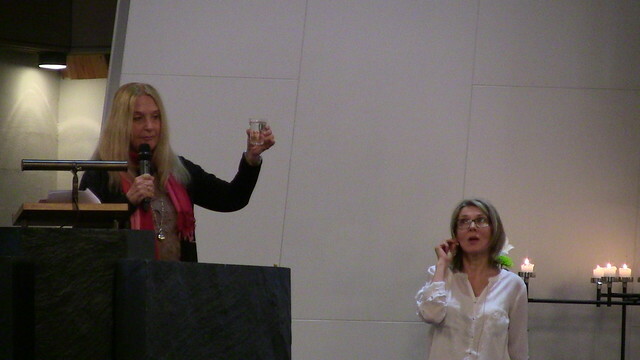 Hanna Mikkelsen did most of the interpreting into Faroese. 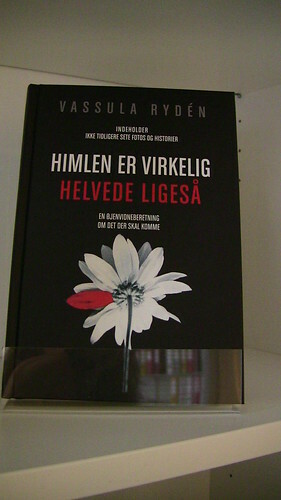 Parenthetically, the first volume of the Messages had just been published in Faroese, a great achievement! 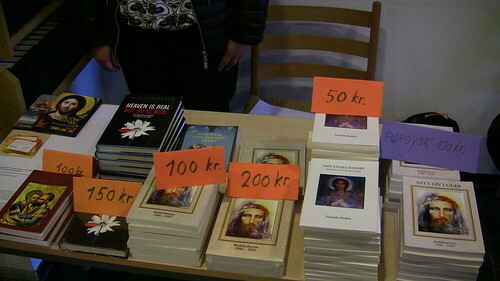 The HIR Book in English displayed on the tables was successful here as well; many people bought it. Hanna talked about the event through an interview on the local radio station called "Kringvarp Føroya”. 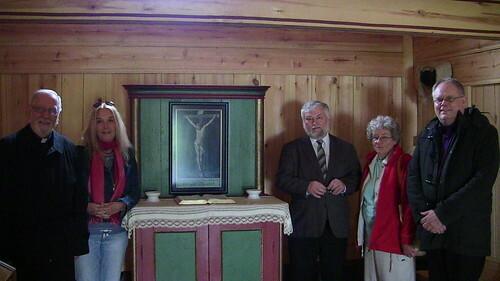 It was aired July 2, on a program called "vikuskiftissendingin" (A weekend program). It is wonderful to see how the Holy Spirit works through different media networks to gather His sheep. It is soothing to hear that the True Life in God messages touch so many young hearts. This salvific plan of God is being sent everywhere; it is as Jesus said many times, a healing balm, or as He expresses it in other words, medicinal. We completed the mission in the Faroe Islands and departed for Reykjavik, Iceland on Monday. In Iceland, Fr. Nicholas, arriving from New York, was to accompany Vassula for the rest of this mission trip. 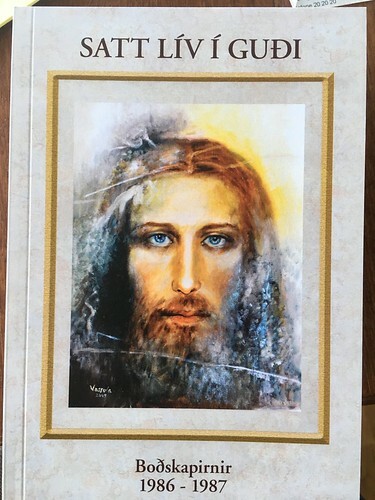 I could not stop thinking of the time when Jesus gave a special prayer five months before the April, 2010 Eyjafjallajökull volcanic eruption occured. About 20 countries closed their airspace to commercial jet traffic and it affected about ten million travelers. 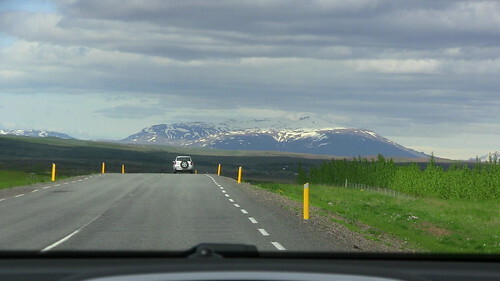 Vassula wrote a letter regarding the Eyjafjallajökull volcanic eruption in 2010 as well. 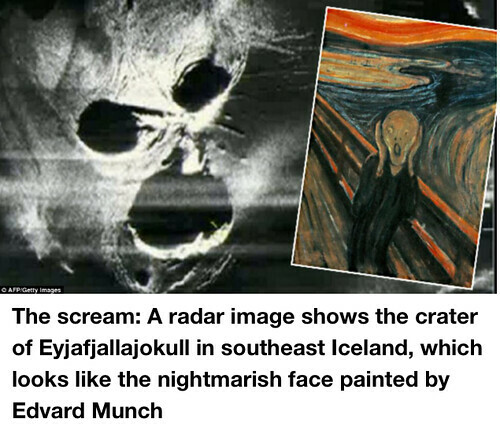 On the April 14, 2010, five months after the Lord gave us that prayer, the Eyjafjallajökull volcano erupted, producing, as we all heard, an ash cloud. The region around that volcano was evacuated. Some people nearby took videos, and one could not properly see a few meters ahead as clouds of ashes covered the atmosphere. Everything was grayish and covered with ash. Air-traffic business became tragic as there were many plane cancellations and millions of dollars were lost daily. Fruits, fish and other products rotted in the warehouses. Travelers were stranded all over the world. The ashes from this eruption continued spitting for a year and a half. As I write this article, we are still waiting to see when the aftermath of this tragedy will come to its end. However, worse things will befall this earth if people ignore God and His callings to repentance. Like Pharaoh, out of stubbornness mankind will suffer for having rejected all of God’s signs in these times, but it will be too late to turn back. 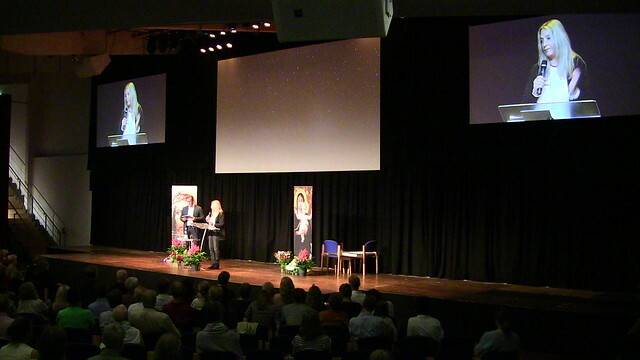 This was Vassula’s second visit to Reykjavík, as she was last invited here to speak in 2004. 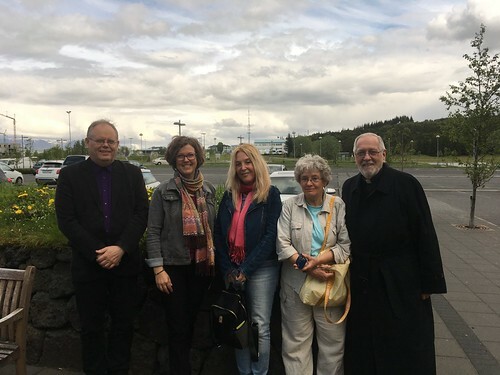 The three of us, Vassula, Father Nicholas and I, were welcomed by Maria Weixelbaumer, who was originally from Austria and now lives in Iceland. At this time we also met one of the organizers and her husband. 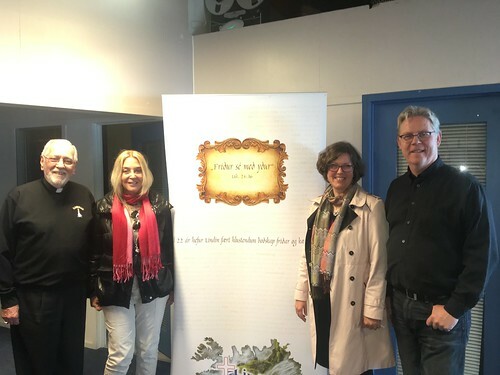 Dr. Maria Agustsdottir and her husband Reverend Bjarni are both Lutheran pastors. We all had lunch together. After lunch, Maria’s husband graciously spent some time with us. Bishop Kristján was very gracious. He made time to meet with us, even though he was going to Germany the next day for the Reformation's 500th anniversary. In his conference room I saw some TLIG books on the bookshelves. He had allowed Maria to place them on the shelves. 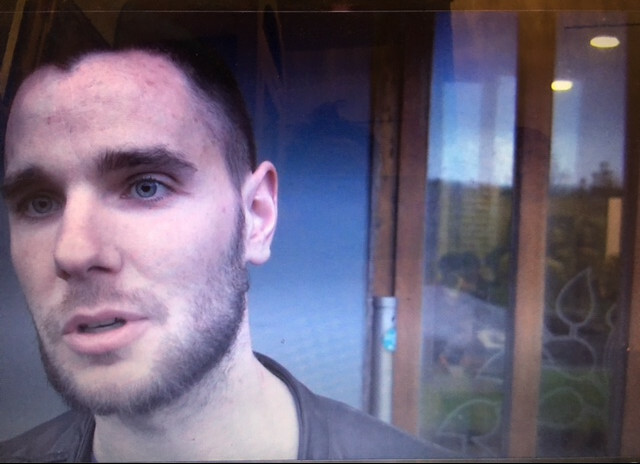 On Tuesday, Pastor Maria had arranged for us to meet with a young Capuchin Franciscan Catholic bishop, Dávid Bartimej Tencer. He was very jovial and his background is from Slovakia. He was ordained a couple of years ago. During our conversation, Vassula spoke to him about the desire of Jesus—the importance of the unified Easter date between the West and East. To our surprise, however, His Grace showed some skepticism and didn’t agree that it is important to have the same date. With this comment, Vassula was convinced that since he did not agree with Jesus’s request, he must not believe that the Messages were indeed from Christ. Vassula continued to inform him about her vision of the three iron bars representing the Catholic, Protestant and Orthodox Churches and that they must ALL bend to accomplish Christian Unity. Humility and Love are the keys to unity. She continued to explain to him about the apostasy in the church etc., but again he was disagreeing, disagreeing that there is an apostasy at all right now. He claimed that the Church is in full bloom, and that all the churches are super-packed with the faithful, like never before, giving as an example his own church. Yes, we thought, but his church encompassed mainly immigrants who needed the support of the church. What about the natives? He was previously telling us about the number of immigrants that were migrating to that land, and how he gives them full support. Vassula wanted to help him understand that the Pope too is working to unify the dates of Easter. 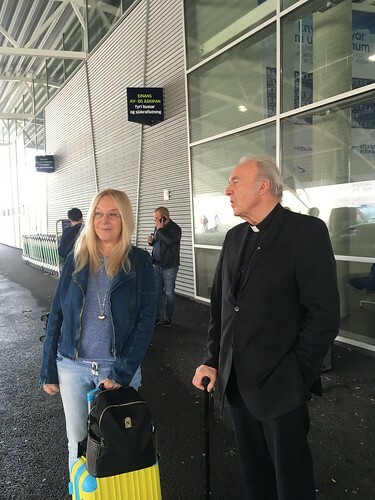 She reminded him of what Pope Francis said to journalists in an airplane interview in May of 2014, during the return flight from the Holy Land. 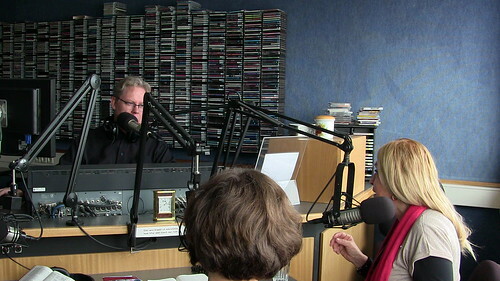 After that visit, we went to the Lindin Christian radio station. 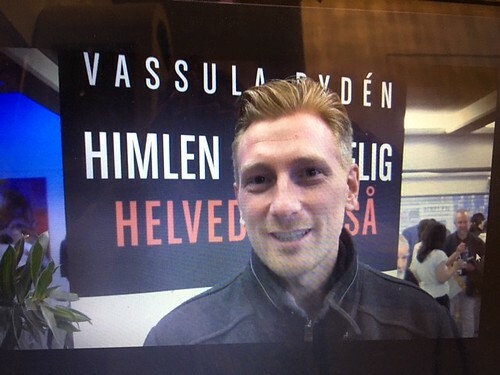 The radio interviewer, Hafsteinn G. Einarsson, received us joyfully and was happy to have Vassula talk on the radio. He interviewed Vassula for approximately 35 minutes. Through that interview, listeners were informed of the meeting. Maria simultaneously interpreted the interview into Icelandic. Hear the interview. As this country is rather new to the TLIG messages, they had only the first volume, and it had just come out in the Icelandic language. It is the forty-third language in which the TLIG messages have been translated. Blessed be God the Father of our Lord Jesus Christ, who has blessed His Work to expand, to grow, to illumine hearts and to guide them to perfection. Through the witnesses of people whom I interviewed, I noticed that some, who might have been so far from God, now have rediscovered their roots in Jesus. We are hoping that they will stand their ground and pray unceasingly. 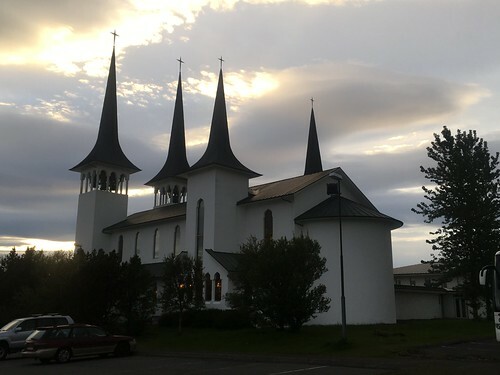 At 6:00 p.m. we departed for the public meeting that was held in the church at Hateigskirkja. People refer to this church as the Four Towers. 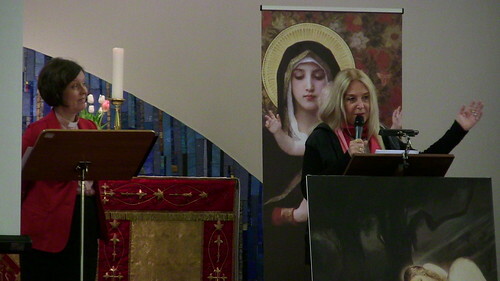 The meeting began at 6:30 p.m. Pastor Maria was again Vassula’s interpreter. At the end of the meeting we all prayed the Repentance and Healing Prayer from November 13, 2006. Vassula’s mission did not end here, but continued with Fr. Nicholas to Nuuk, Norway, Finland and Sweden. I had to return home. 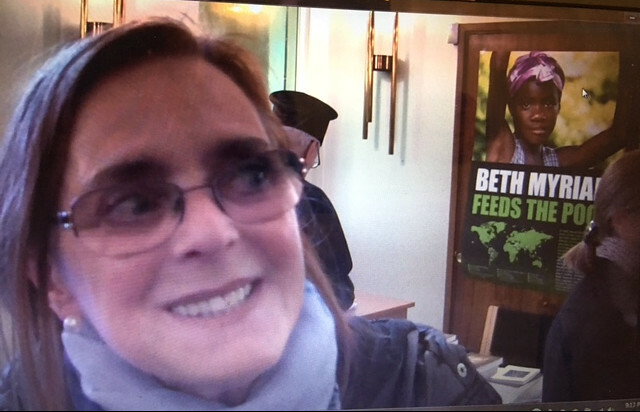 I am so thankful for the chance to see how the Messages have touched the people in Denmark, the Faroe Islands, and Iceland. Their hospitality and all of their work was felt from the heart!